* BUGFIX: New event notification no longer throws an error regarding "ShowIcon"
Still Broken and the thread on curse is a bit confusing. Many years of service I do thank you, but for now I will have to uninstall. This is still broken you can look at the thread on Curse for more information! I am noticing a Green Tile on certain events. Not sure exactly which one but it shows just fine on the WoW Calendar. If you need screenies let me kno and I will try to get them up somehow lol. Hi! I use OpenRaid.us's addon to import events into my calendar more easily. I've noticed two things: 1) is that when GC5 is enabled it hangs on the first event and simply keeps repeatidly posting the same thing over and over and 2)Once I've disabled GC5 and gotten the events imported then turn GC5 back on I no longer have the ability to edit any event. Is there something I'm doing wrong? I'm working on an update to GC5 for the new patch and will also try to address this issue. 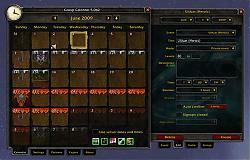 My fix is to not hook any of the Blizzard Calendar APIs, which I believe may be the cause of the problem. I hope to have an update later today. Let me know if it takes care of this. The additional window opens up once you click a date or an existing event -- it's not there all the time. I'm still not seeing any problems myself, but I'll try wiping my GC5 data to simulate a new user and see if there's some sort of first-time initialization bug. It was me. Somehow when I put GC5 into my addons folder I left it inside it's GroupCalendar_5.4.4 folder. It's working fine as far as I can tell. Sorry for the post. I'm not sure what the poster below is talking about but I tried the latest version last Thursday. I had and "issue". I did not get an additional window to the right of my calendar like shown in the screenshot. I did not get the tabs at the bottom. I thought the addon wasn't loaded so I checked for a method to "turn it on". I found nothing in the normal broker controls or load out of date, etc. At one point I did get a message that an alt had a raid starting in 15 minutes so I'm thinking all this was just me being a noob. I'm going to try it again today but my thought is I'm either missing the obvious (which happens) or there is some kind of error. seems broke in 4.3, anyone have fixes? I haven't found any issues at all so far. What problems are you seeing? Maybe there is a way you could add in the ability to SHOW an event to all guilds involved without inviting every last member. then those who CAN come could sign up. 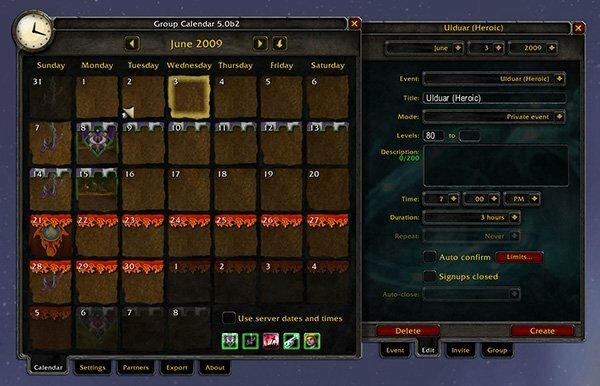 I WOULD if BLIZZARD would make that POSSIBLE with their CALENDAR. But they DON'T so I CAN'T. Last edited by mundocani : 10-10-11 at 08:40 PM. OK Here is something that I am trying to figure out with Group Calendar. With the set limit of 100 members to invite, we cannot get everyone invited without spending 30 minutes sitting down and going "ok who from your guild are we inviting..." and vice versa. There is no way to mark someone as a main or anything without creating a guild rank (and that is something I am not willing to do).